Wedding, be it love or arranged, always an interesting affair. Indian marriages are one month long with the four corners of the earth to relatives, friends and colleagues at one of the colleges at the school every organization working in the courtyard of the crowd, adding vitality to the event. The bride and groom are starting a new life together their own tension. Fear, excitement, thrill, blues, love, commitment, stress, etc. – All this kind of emotions are running high and their mind that they need to look good, because it is their marriage. One of the best of marriages is that the bride and groom are just a Bollywood film as hero and heroine who had pampered every small step. But the glamor and glitz, on which no sense, if the place where the wedding is to be held. People now approach the professional Wedding Planners and decorators for a day to make sure their wedding is the talk of the town for some time by the guests who attend it. 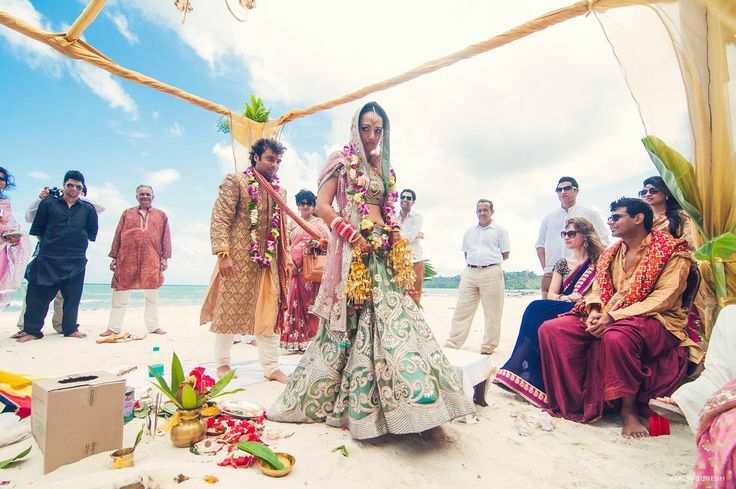 Take a look at some of the most popular wedding destinations in India, if you are planning your wedding outstation guests witnessed the greatest, largest and most spectacular wedding event ever. 1. Jaipur, Rajasthan: The capital city of Rajasthan is often known as the Pink City due to the trademark color of buildings. This city offers a great heritage and beauty and many big fat weddings are held here in palaces and mansions. For those who are keen to have a royal wedding, Jaipur would be the perfect place to tie the knot. 2. Udaipur, Rajasthan: Rajasthan is a state that has the maximum number of forts and palaces most of them are now converted into five star resorts. These five star hotels and resorts serve as a great wedding venue. The Leela, The Taj Palace, and The Trident are some of the best places there in Udaipur for the best experience in your life. Also check out fort locations like Devi Garh, Manek Chowk, Oberoi Udaivilas, Durbar Hall at Fateh Prakash Palace, and many more. 3. Delhi: This place is one of the most favorite wedding destinations due to the luxury it offers. Some of the class hotels where you can witness the most special day of your life are: The Tivoli Grand Resort Hotel, Ambience Golf Drive – Ritz, Rivera by Ferns n Petals, The Taj Mahal Hotel, The Imperial Hotel, The Park Hotel, etc. Sainik Farms, Kundan Farms and Shagun are also the most famous wedding venues in Delhi. 4. Andaman & Nicobar Islands: If you have ever been to the Andamans, you would also agree that, this place is one of the world’s most beautiful locations. Imagine your colorful shamiana over the white sand and make it real because this would be the best experience of not only your life but also those who would be attending your wedding. 5. Kerala: Due to its scenic beauty and backwaters, Kerala is nick-named as “God’s own country”. Beaches of Kovalam, tea estates of Munnar, heritage building of Kochi fort, are some of the striking locations that can be considered as a wedding destinations in India.